While social media sites like Facebook continue to grow in popularity, a good website is an important but overlooked communcation tool for a Squadron. Recently we spoke to Wing Captain Walter Savell, Squadron OC of Gold Coast Squadron on the recent relaunch of their Squadron website. “The squadron website is our focal point of communication with cadets, parents and prospective members. For cadets the website provides easy access to the term timetable, enabling them to learn what is planned for each parade night and uniform requirements for the night, for example full uniform, summer uniform or sports uniform. The cadets (hopefully) come prepared with the required resources for the evening’s activities. The cadet is also kept informed of upcoming external activities. The squadron website is our focal point of communication with cadets, parents and prospective members. For parents, the website also allows them to see what activity is set down for the various parade nights and information on external activities (fundraising BBQ’s etc). Our quarterly newsletter can also be found on the website. The newsletter contains reports from officers on their areas of responsibility covering the term just completed and activities proposed for the coming term. For prospective members the website has proved to be a useful and important promotional tool. 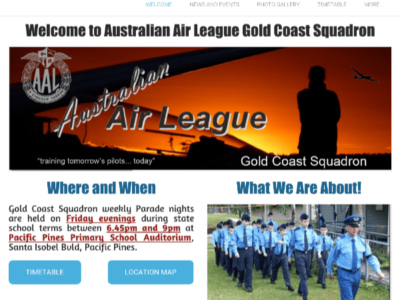 When doing a google search for “Air cadets Gold Coast” our webpage is always near the top of the list and becomes an initial source of enquiry from interested parents. The website gives prospective cadets and their parents a total overview of the squadron. As squadron OC it saves a lot of time when enquiries are received from parents of potential cadets. Many have already seen the website so only have one or two questions. Others, I provide some brief information about the squadron, meeting place and time, I then refer them to the website for browsing more comprehensive information inviting them to phone back if they have further questions. While a Squadron social media page is very easy to set up, it does have a number of limitations. For example, Facebook has an age limit of 13 years, making it unsuitable for many cadets to check Squadron news, also some parents may be reluctant to let their children spend too much time on social media. Finally, putting all your content on social media is like building your house on “rented land” – changing fashions may see today’s popular sites become tomorrow’s “Geocities“, or a change of terms and conditions could adversersely affect your efforts.